Rapper G5 Elz has released a new music video for his track, "Young Mitch," featuring Keem Bellair! 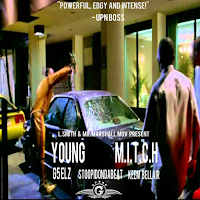 Directed by Mr.Marshall.Mov, the video and track itself is inspired by the rapper's favorite movie, Paid In Full. The record is the first single from G5 Elz's upcoming mixtape, Northside Punch. For more info on the rapper, visit his official website. You can also connect with G5 Elz on Facebook and Twitter, and hear more of his music on YouTube and Soundcloud!